Saturday morning's practice sessions showed that the cars had good pace with the lap times improving as the morning went on. The afternoon's qualifying session saw Colin dominating from early on, gradually improving his times throughout the 30 minute shoot out and showing an outstanding performance being the fastest out of the four Subaru Levorg GTs and fastest overall with a time of 1:23.608. This was Colin's second consecutive pole position, showing that we have the pace to dominate. There was disappointment for Warren as he fought hard to be the highest placed of the Subarus and ended up having a brief sideways off into the wall. The car was repaired and he completed the remainder of the session. James was also left deflated after setting an impressive time of 1:24.20 before having it disallowed for exceeding track limits. Jason set the 4th quickest time but disappointingly his bid for pole position was hampered by a fuel surge problem that we are rectifying with TOCA. Warren qualified in 21st and James in 25th with a gap of just 1.4 seconds between the quartet. The opening encounter on Sunday brought a historic 1-2 finish for Silverline Subaru BMR Racing in a race that was plagued with incidents and three safety car periods. Starting from pole position Colin had a great start with 2nd place starter Daniel Lloyd attempting a move around the outside into the first corner. Thankfully Colin escaped without damage and retained his lead. The incident also caught a number of other cars and brought the safety car to the proceedings. Jason had an equally impressive start to the race, moving to the inside line and tucking up behind Colin and settling in 2nd place. When racing resumed on lap 3, Colin held off Jason with both cars setting superb lap times, the fastest of the race set by Colin on lap 5. Then, Kelvin Fletcher first tagged Dan Welch at the hairpin, which resulted in Fletcher spearing James off on the outside of the track, ripping the wheel and suspension off the rear of his Levorg and putting an end to his race. Colin did all he could to make a break from the now bunched up chasing pack and led home the Subarus for a 1-2 finish with a gap of 1.3 seconds to Jason. Warren came home in 16th place and just one place short of a point scoring position. A delighted Colin collected the winner's trophy for the 38th time in his BTCC career and a second time for us at Silverline Subaru BMR Racing. An ecstatic Paul Tunniciffe, Managing Director of Subaru UK, also took to the podium for the second time in 2016 to collect the winning manufacturer trophy for Subaru UK. Following on from the superb results of the opening race, Colin lined up for race 2 in pole position once again, albeit with an extra 75Kgs of success ballast on board with Jason alongside him on the front row with 66Kgs. Warren would start from 16th with James having plenty of work to do from 26th after the team did a stellar job repairing the rear of his Subaru Levorg GT. As the lights went out it was Jason who got off to a flyer and shot into first place as Colin tucked in neatly behind him in 2nd. With our 'no team orders' policy the battle for the lead continued until lap 8 when Jason went for a gap in an attempt to pass up the inside of Colin at Tower but the two cars made contact sending Colin sideways, which in turn slowed up Jason and Goff, allowing Collard through from fourth to take the lead forcing Jason back into 2nd and Colin into 3rd. Jason doubled up with another podium in 2nd with Colin right behind him in 3rd. Warren finished the race in 26th place in his rather battle scarred Levorg. 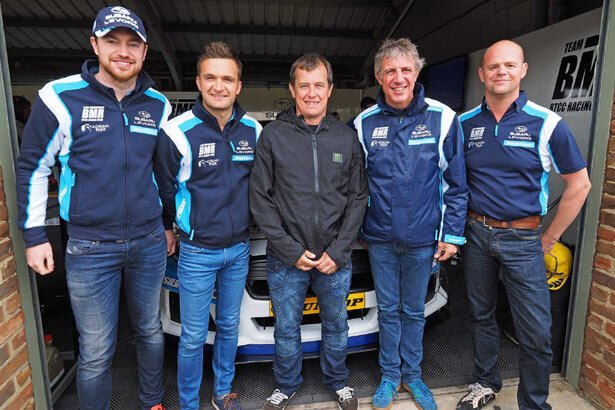 The reverse grid draw selection was made by Team BMR guest and 23 times Isle of Man TT champion John McGuinness. Number 8 was pulled out placing Sam Tordoff in pole position. Colin would be the highest placed Subaru in 6th, with Jason in 7th. Warren would take his finishing position from race two placing him 26th with James at the back of the grid in 32nd after his non finish. As the cars took to the grid the rain started to fall and with it only being light, the stewards hadn't called a wet race and it was up to the teams to choose which tyres to run, so a few took a big gamble and ran on slick tyres. 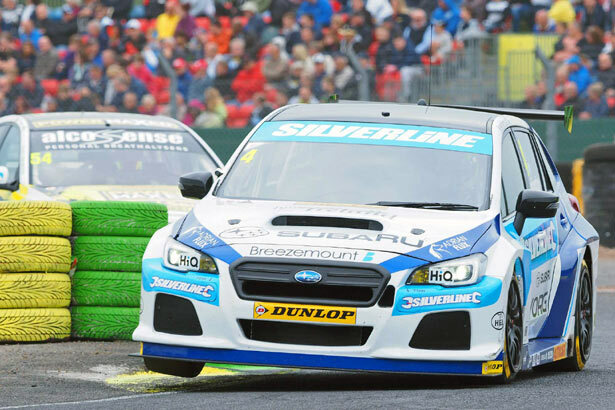 All four Subaru Levorg pilots elected for wets and it soon became apparent that was the right choice as the heavens opened early on in the race. Once again all four drivers made a great start, but unfortunately it was Warren this time that was forced wide and into the gravel trap on turn one, bringing an early safety car period. Colin had made his way up to 4th as Jason lost a few places and sat in 11th. James remained at the tail of the field having not made any advantage thus far. At the end of lap 9 Ash Sutton made a move in the MG, making contact with Colin which then gave an advantage to the BMW of Collard and forcing Colin back into 5th place. The last two laps would be a sprint to the line with Colin finishing in a great point scoring position with 7th, Jason 10th and James 21st. Rookie Sutton took the win, the first of his BTCC career. Warren Scott: "Once again I am absolutely over the moon with the results for the team over the weekend, I think it really shows how far the guys have brought the Levorgs on. We've still got a lot to do in the second half of the season but we're feeling very confident with the challenge that lies ahead." Jason Plato: "Another great weekend for us, we are making great progress with the Subaru Levorg. To be as competitive as we are at this early stage in the cars' development is very exciting as we know there is still so much more performance to unlock. Race one was another historic milestone for the team with our first one-two, it was a shame that Colin didn't see my move for the lead in race two as I'm sure we would have had produced another one-two. The wet race three was a learning curve for me as it was my first wet race in a rear wheel drive touring car. After the first few laps I recalibrated my driving style and was thereafter setting fastest laps. I can't wait for Snetterton to come, I really believe the second half of the season will belong to us. Huge thanks to everyone in the team, our success is a result of their huge efforts. Cheers boys and girls." Colin Turkington: "I'm really pleased to continue my race winning form at Croft and make further strides with the development of the Subaru Levorg. We did the hard work on Saturday, claiming another pole position and that helped set me up for a good race day. 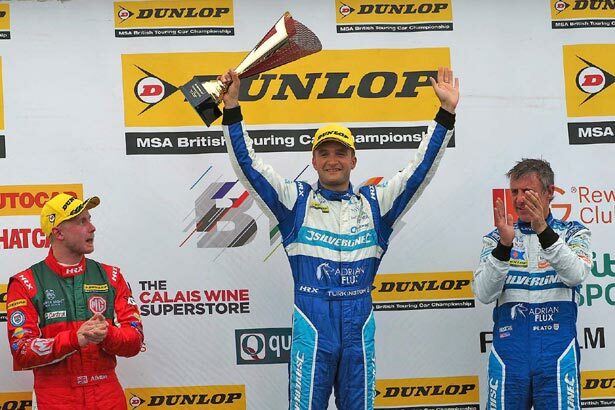 Wins don't come easy in the BTCC and I had to work really hard for this one, especially with three safety car periods. Croft was a track that played to our strengths, but it was still an amazing job by the team to turn up and deliver the results that everyone expected. Two podiums in any race weekend is a good return and overall I'm happy to walk away with a good haul of points and another victory." James Cole: "I received a tweet on Sunday night from a Subaru fan saying 'If James didn't have bad luck he'd have no luck at all...' - couldn't have summed it up better myself. It's amazing how your weekend can be shaped by one decision. From being 7th in qualifying with a minute to go to 25th sixty seconds later because of a judicial decision is a tough pill to swallow. My aim for Croft was to qualify solidly inside the top ten and get three solid results, which would have been a great step forward from Oulton Park. The positives to take out of the weekend are we achieved our aim only to get it taken away. With the championship being as competitive as it is, it was always a tough ask to carve through the field, even with a proven place."